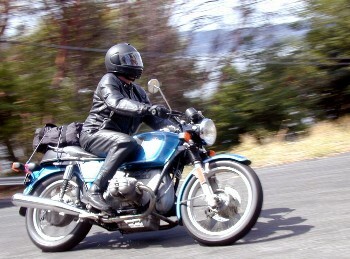 I own five bikes, most of them less than 25 years old, but in 2002 I restored a 1972 Honda SL350. It dons a collector's plate for my state and I take it out several times each year to attend vintage bike events. While most of the attendees of these events trailer or truck in their iron, I enjoy riding to and from the event as well. Inevitably I see a crash now and then, come across a breakdown and not an event goes by where I don't hear the thunder of straight pipes on an old bike. There's a number of things I do each year when I dust off my bike to insure I have the best experience I can when I'm out having fun. Don't just kick the tires � If your bike has been sitting all winter you'll surely want to get your tire gauge and pump in motion and inflate the tires back to the recommended levels before that first ride. But there's more to consider than just that. Like how about the age of the tire itself. The older a tire gets, the harder the rubber becomes and the less traction you can count on when you hit the road. Even if you only ride your vintage bike a hundred miles each year, you should consider putting new tires on it every 3-5 years. Ditto for inner tubes and valve core replacement. And remember, if the vintage event you're riding in is a dualsport it's okay to air down 10-15% on the unpaved areas just as you would on a modern day dualsport bike. Old gas be gone � Old gas sitting in a carburetor for several months can tend to clog the jets by going bad and becoming the equivalent of turpentine. There are several ways to stop this from happening before it starts. During the fall when I know I've done my last ride for the year, I take the bike to the gas station and fill it full of premium. Before I close the gas cap I pour in the appropriate amount of fuel stabilizer based on the 2.2 gallon gas tank. On the way home I make my final move by shutting off the petcock a few blocks from home and leaving the bike running when I arrive until it dies from thirst. With an empty carb I park it and throw a cover over it. Battery check � Just like tires, batteries can become less reliable as the years go on. It's best to change these every 4-5 years and don't wait until the as-needed moment arises, which may not be in as convenient a place as your garage. Re-fuse to win � Most vintage bikes feature the old style glass tube barrel style fuses known as British Plug types. With all the vibration, an old bike can make these eventually fail by coming apart in the fuse holder itself. You can keep this from happening by replacing the old school fuse configuration with a blade style ATO fuse and fuse holder. To reduce further vibration, mount the fuse using a little Velcro on the frame or battery cradle. Oil leaks � Walking around the parking area of a vintage event it quickly becomes apparent that most old bikes leak oil. Mine included. Seems that every time you fix one leak, another comes up. I can put up with a small leak for awhile but there comes a point when enough is enough. I recently saw one rider who had so much oil pouring from his head gasket it was creating a dangerous volume of smoke that would fill his helmet at each stop. An oil leak like that is unhealthy for the rider and a waste of oil as he was losing a quart of oil about every fifty miles. With today's technology there are computerized gasket cutting machines that can recreate gaskets for any kind of bike. Is it time to locate the one nearest you? Exhaust annoyances � Loud pipes in excess of legal decible levels aren't relegated to just the Screamin' Eagle and Cobra straight pipe crowds. 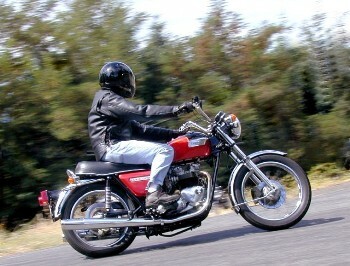 Many vintage bikes are notorious for exceeding legal exhaust decibel levels. Not doing anything about it won't help you when you're trying to keep an event going year after year while the locals ask government to put the pressure on to shut down your event. Quieting your pipes will help non- participants forget you're around and save your own hearing as well. Take a test ride � The day before my first ride event of the year I pull the cover off the bike and roll it out for a safety inspection. Tires, battery, oil, brakes, lights and throttle all get checked before I finally throw a leg over the bike and give its first kick of the year. It usually starts by the second try! Then I take it out for a five mile ride, listen to it, feel it and correct any issues before my big ride the next day. Above: Just because your bike was built in 1960, there's no reason to wear blue jeans designed in 1860. Always wear the gear. Ready for the breakdown? � When you get ready to ride, be sure to bring along the items that will get you out of a pickle if need be. The proper assortment of fix tools, a tire repair kit, a small pump, spare bulbs and fuses don't weigh much and can get you or a riding friend back on the road quickly without having to call a tow truck. Some riders like to carry a small tube of slime to handle flats, but remember to get the tire off as soon as possible to limit any corrosion that slime can cause to various types of metals or powder coatings on wheel rims. You ride well, but... - How about that stranger in front of you? � For some riders, vintage bike events are the only time they ride. I know the owner of a dealership who doesn't ride all year until late summer when he pulls the old Triumph out for the vintage poker run. His riding skills leave much to be desired and the message here is to keep your distance with plenty of room between you and the riders in front of you. Expect the worst and be prepared to react. Know your bike's limitations � I spend most of my riding time on bikes with plenty of power and great braking abilities as a result of the disc brakes they have both front and rear. When I step onto my 1972 model that all goes out the window. I need a lot more braking distance for those drum brakes to stop me and there's hardly enough power for passing moderately moving vehicles. As long as I keep this in mind I do a good job staying out of trouble. Clean it up � After the event clean your bike up so it's ready for the next time. Getting dirt and gunk off it right away will insure the hard effort you put into restoring will not be without cause and you'll have more time to ride and spend less time refurbishing later.